Chanteuse Country US née Judith Kay Newton, le 18 Février 1952 à Lakehurst Naval Base (New Jersey). 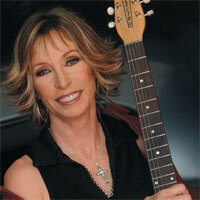 Juice Newton (born Judith Kay Newton, February 18, 1952, Lakehurst, NJ) was part of the first wave of country singers raised on rock, folk-rock, and singer/songwriters, which is evident from her hit singles. "Angel of the Morning" and "Queen of Hearts," her two crossover hits, have country-pop arrangements, but their roots are in '60s pop and new wave roots rock, respectively. That's why she managed pop crossover hits in the early '80s and also why she was able to sustain country success throughout the decade. Although Newton was born in New Jersey, she was raised in Virginia. As she entered high school, her mother gave her a guitar, prompting her infatuation with folk music. After graduating from high school, she attended Foothill College in Los Altos Hills, CA, where she continued to play folk in coffeehouses. During this time, she met Otha Young, a fellow guitarist and songwriter. The two formed a folk-rock band called Dixie Peach and began playing bars around northern California. Dixie Peach only lasted a year, but they did gain a local following while they were active. After the band broke up, Newton and Young formed Juice Newton & Silver Spur, which had more country leanings than Dixie Peach. They were also more successful. Their fan base was large enough to convince the band to go to Los Angeles and try to land a record contract. In 1975, Juice Newton & Silver Spur signed to RCA Records and released an eponymous debut which spawned the minor hit single "Love Is a Word" in early 1976. Later that year, the group released After the Dust Settles, which didn't attract much attention, and RCA dropped them after its release. The band signed with Capitol Records, releasing Come to Me in 1978. Like its predecessor, the album was more or less ignored, causing the Silver Spur to disband. Though Silver Spur had broken up, Newton and Young continued to work together. Newton still had a contract with Capitol, and the pair immediately began working on her solo debut. 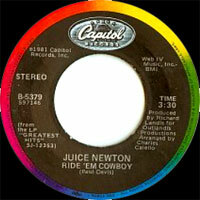 The result, Juice, was released in early 1981 and quickly became a crossover hit. The first single from the record, "Angel of the Morning," reached number four on the pop charts, and it peaked at 22 on the country charts. "Queen of Hearts" was a bigger hit, reaching number two on the pop charts and number 14 on the country charts. 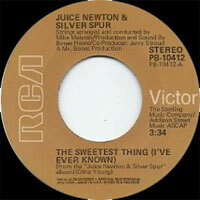 "The Sweetest Thing (I've Ever Known)," the third single taken from Juice, was her biggest country hit, peaking at number one; on the pop charts, it hit number seven. Juice would eventually go platinum. 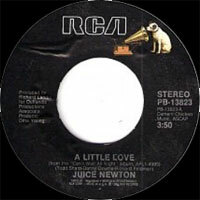 Newton's follow-up album to Juice, Quiet Lies, was released in the spring of 1982. It was also a hit, spawning the pop Top Ten "Love's Been a Little Bit Hard on Me" and the number two country hit "Break It to Me Gently." The album won a Grammy for Best Country Vocals Performance, Female; it also went gold by the end of the year. Dirty Looks, her third solo album, was released in 1983. 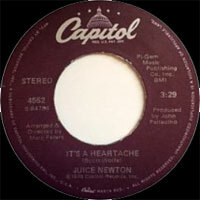 The record marked the first time Newton failed to crack either the pop or country Top 40. In 1984, she switched labels, signing with RCA. Newton's first album for the label, Can't Wait All Night, was a transitionary album, seeing her move away from pop and begin to concentrate on country. Old Flame, released in 1985, was her country breakthrough, spawning the hits "You Make Me Want to Make You Mine," "Hurt," and the duet with Eddie Rabbitt "Both to Each Other (Friends & Lovers)," which all went to number one; the album had three additional Top Ten hits -- "Old Flame," "Cheap Love," and "What Can I Do With My Heart." Old Flame happened to be Newton's only major country hit. Its follow-up, 1987's Emotion, only yielded one Top Ten hit, "Tell Me True." In 1989, she released Ain't Gonna Cry, which featured the single "When Love Comes Around the Bend," which barely scraped the Top 40. Ain't Gonna Cry turned out be Newton's last album for several years. She abandoned country and began performing showy mainstream pop, which she performed in nightclubs. Throughout the '90s, she continued to perform live concerts without recording any new material for years. Finally, she reunited with producer Richard Landis in 1997, recording The Trouble with Angels, a collection of re-recorded hits and new songs that was released in the spring of 1998.